The real skill in reviving and monitoring critically ill patients is performing effectively and reliably when under pressure. 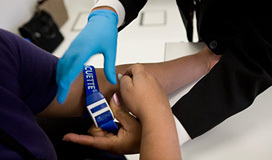 The Learning Hospital's Advancing Clinical Skills courses teach all healthcare professionals to assimilate, refine and embed a variety of resuscitation and assessment techniques - from basic BP monitoring to advanced life support. Emphasis is placed on high-quality content and methods that train participants to think and act calmly when under pressure. This includes learning to put anxious or difficult patients at ease quickly and identifying phobias (eg, needles) and other issues before they become significant barriers to treatment. Visit the Booking & Room Hire page to enquire about prices and availability for The Learning Hospital's clinical skills training. 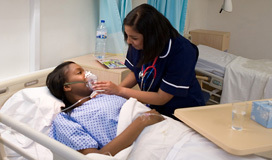 Our students are taught resuscitation using purpose-designed simulation mannequins, with every action recorded by camera and copied to DVD for subsequent appraisal. If a valued member of your team could do with a refresher course, we are here to help. Do not leave it to chance. "The advanced paediatric life support course was focused on improving my practical skills, which got rid of my nerves and enabled me to deal with paediatric emergencies confidently". 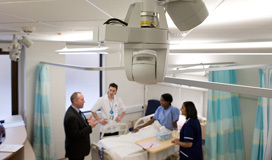 The advancing clinical skills unit is also set to become a centre of excellence for investigative radiology. We offer prospects for all clinicians - regardless of experience - to sharpen skills and potentially bring their entire department up to speed. Use our resources to understand the full role of ultrasound in diagnosis and experience the advantages of multi-branch, high-definition microscopy in histology.